Basset Bones | George Knows It All! Home of the star of George Knows. George Knows It All! Home of the star of George Knows. About Me, a perfectly designed basset. Mindy will be awarding a $25 Amazon or B/N GC to a randomly drawn winner via rafflecopter during the tour. It’s not often a basset hound puppy is haunted by an unhappy ghost, but George’s packmate, Tillie, manages to attract one. George and Tillie need to find out how to help the ghost before she turns into a poultry-ghost. I turn to Tillie. That’s a sound I haven’t heard before. She makes it again. 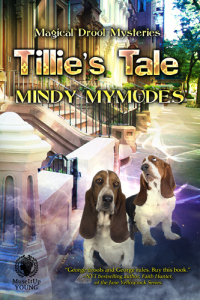 Tillie’s Tale by Mindy Mymudes. via Tillie’s Tale by Mindy Mymudes. 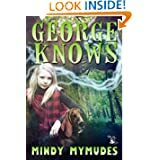 Paperback Copies of George Knows Goodreads Contest! Most of the members who read this blog have no idea why they are here, or what George is. George is an egotistical basset hound familiar. In real life, George is a collection of scenes recalled from my rescue dog, Quark. Quark was a rather unique springer spaniel. From stealing a ball from Joe Montana in River Falls (and getting me in a ton of trouble), to breaking out of my house to come to the Greenhouse I managed on the Campus of UW-RF to snore and steal my students lunches, Quark was a handful. His decision to bring home a friend, a boy, because every dog needs his boy, led us to fostering an 8 year old Joey. Quark found human bones, and his accomplice in crime, Charm, climbed trees. It was an interesting time. True Facts in the George Knows Chronicles. Forget what you may have read before about witches and their “familiars” – animals who work with and communicate with them. Usually, it’s a cat – a black one – that’s involved. But in George Knows. the title character is a lovable basset hound who is the familiar for a young witch-in-training – 12-year-old Karly. “Witchiness” runs in the family. Karly’s Aunt Heather is an herbalist and healer who, with George, is teaching the young girl to develop her inheritance of the family’s gifts, including mental telepathy. 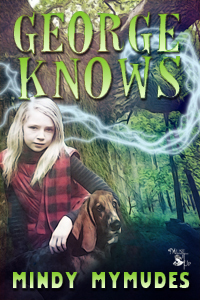 When human bones are found by George and Karly as they’re out walking in the park, all their supernatural wiles will come in handy to solve this mystery. There’s also a side story about saving the park from developers, and even a budding romance thrown in. Writer’s Retreats — Our Thoughts, Part Two. Suzanne de Montigny on Where Do I write? mudepoz on Where Do I write? Dee on Where Do I write? Nancy Everitt on Where Do I write?